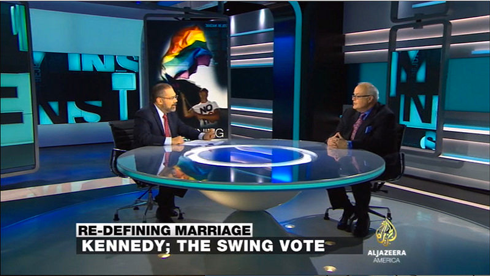 The change was brought about by Al Jazeera’s recent move in Washington, from K Street to New Hampshire Avenue. The new location includes two studios and a newsroom. 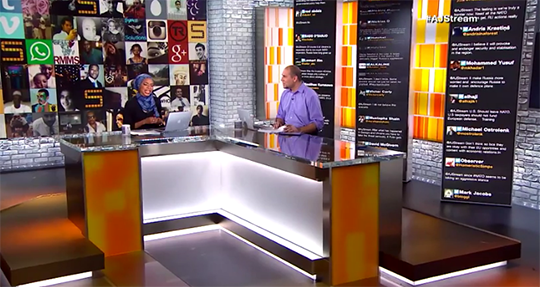 Studio A is home to “The Stream” on Al Jazeera English, and includes an urban space that’s been infused with technology to support the show. Vertical monitor columns become conversational waterfalls of viewer messages. An LED ribbon flows through the floor, folds up to form the desk, then rises up to the ceiling, forming a physical embodiment of “The Stream” itself. 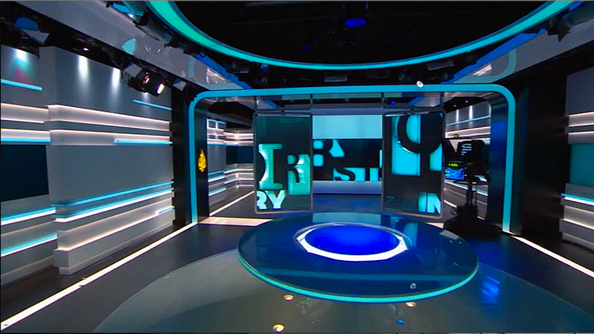 Studio B is a larger, flexible space built to house a variety of shows, including “Inside Story” and “Min Washington,” with the potential to add future programming.The studio features a circular anchor desk and metallic and gray toned walls interspersed with video panels, including adjustable two ceiling-mounted ones. These panels are placed in front of a larger wall-mounted video wall, adding depth and layering to the design. The walls of the set include inlays with bright accent lighting in white and teal, as well as some backlit panels, as well as additional smaller video panels. Other features of the set include a circular internally lit ring and ribbon that arches over center of the set as well as a wall mounted Al Jazeera emblem. Jack Morton PDG worked with AV Design Services for the AV integration on the project and The Lighting Design Group for the lighting design. This story was updated on May 29, 2015 with new details about the project. h/t to TVforum.co.uk for the images.